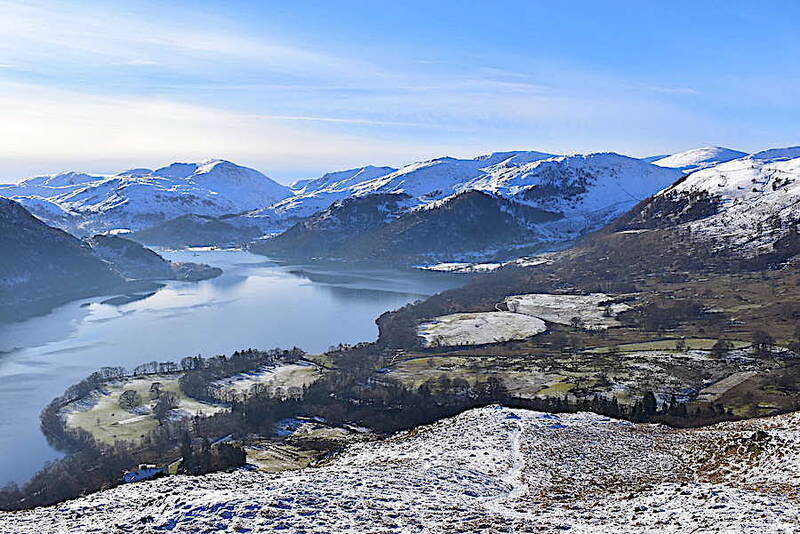 Today’s walk only sprang to mind yesterday when we saw last night’s weather forecast predicting that a calm sunny day would be on the cards, so it seemed like the perfect opportunity to get out on the fells and put my new camera through its paces. I’ve been dithering about this purchase for the last two years and you’ll know the arguments you have with yourself, do I really need it, there’s nothing wrong with the one I have already, am I really willing to part with the cash, etc. etc. Anyway I finally got on with it and thus it was duly delivered. I’ve only had it a day and, having other more urgent things to do yesterday, I didn’t have much time to get to know what all the new bells and whistles do. Last night I had a read through the instructions (printed on a sheet of paper large enough to cover three-quarters of the dining table and in very small print!) and began working through the various menus and arranging the settings to what I hoped would produce reasonably good enough photos. They worked out well enough in the event but there is still a lot of fine tuning to be done and a lot more reading of the pdf. document I was advised to download, so its a work in progress. It was -5 C when J stepped out onto the drive to coax the car out of the very deep freeze we’ve had overnight and it took quite a while to remove all the frost and then encourage the engine into life. It was more than reluctant to do so and we began to wonder if we would ever get the thing going. 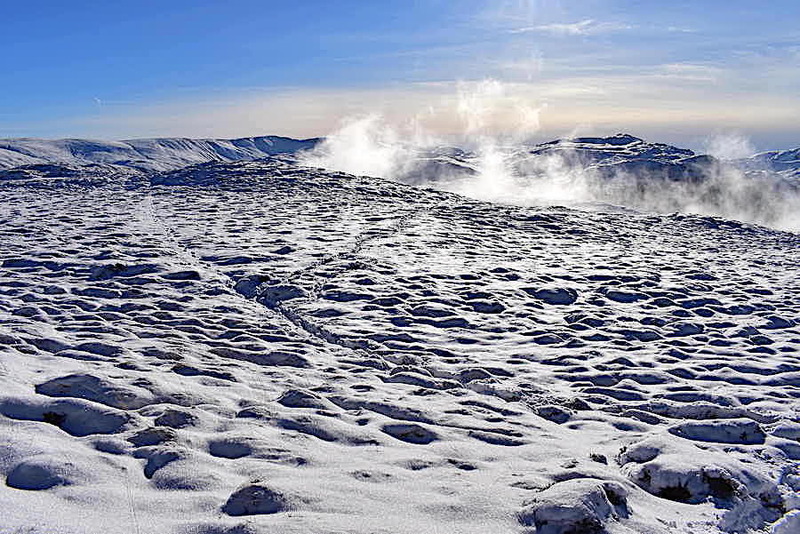 Patience was eventually rewarded though and it finally decided to start, so in we climbed suffering, as we did so, a short sharp shock to our rear ends as they met up with the icy cold seats. I could sit on my hands until things eventually defrosted, J had to put up with it since his hands were needed on the steering wheel. 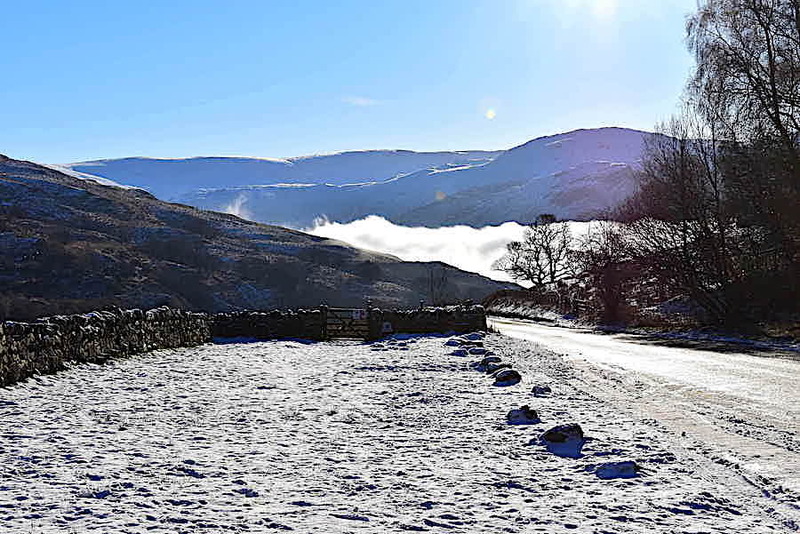 We could see the huge inversion over Ullswater as we drove through Pooley Bridge and we were in thick fog all the way along the shore road until we turned up the A5091 just beyond the Aira Force car park. 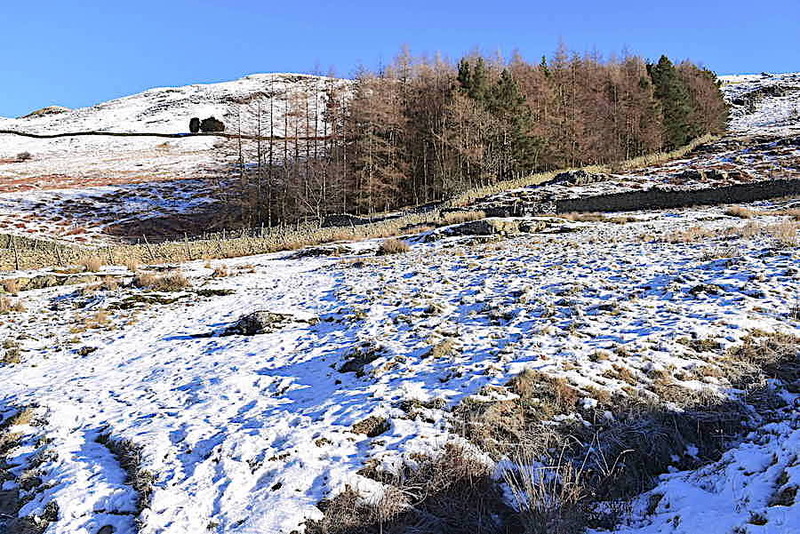 By the time we reached the parking area in the old quarry further up the road we were back in clear sunny air with the occupants of the only other car parked there just about ready to leave. Eager to get going with the new camera I headed across the road to the former lay-by while J got his stuff together and locked the car. 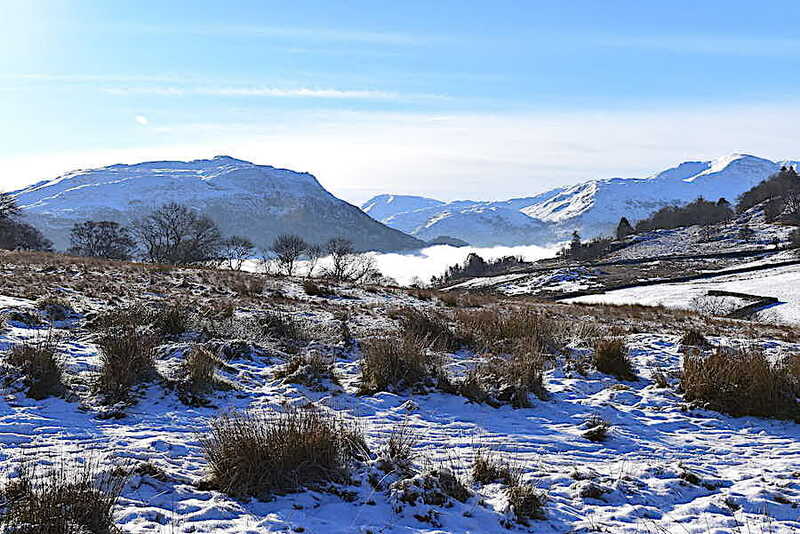 The dense white cloud, looking like cotton wool, in the middle of the shot is the inversion over Ullswater we have just driven through and its always a fascinating sight. 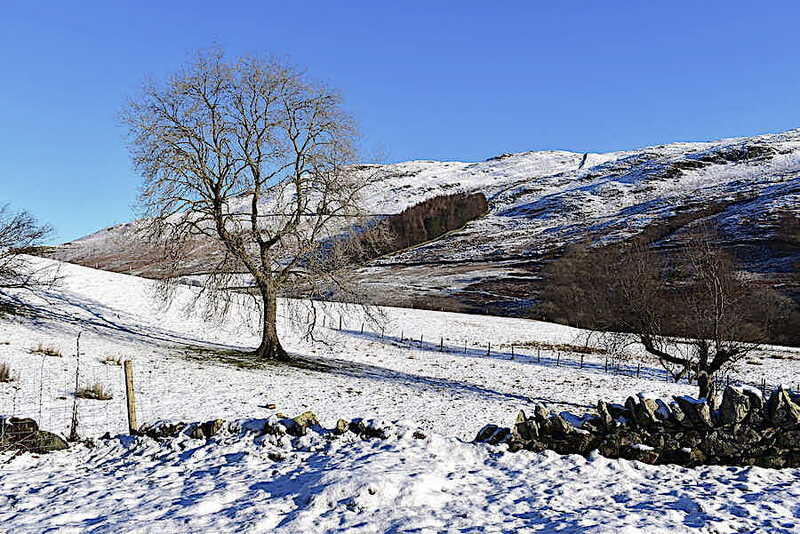 Another shot from the old lay-by, this time looking across at what will be our route up Gowbarrow, alongside the stand of trees in the centre and then more or less following the wall up to the ridge line. 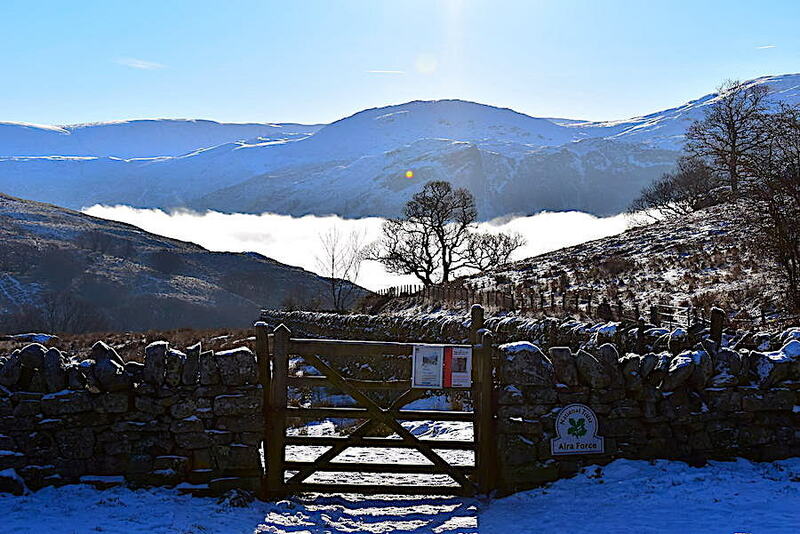 J was still getting organised so I took another shot towards the gate at the start of the path and another look at the inversion. The old camera wouldn’t have coped with this type of shot at all. I know, I know, but I just wanted to have a go with the zoom lens while I was waiting. J joins up with me at last and off we go down the path towards Aira Beck. 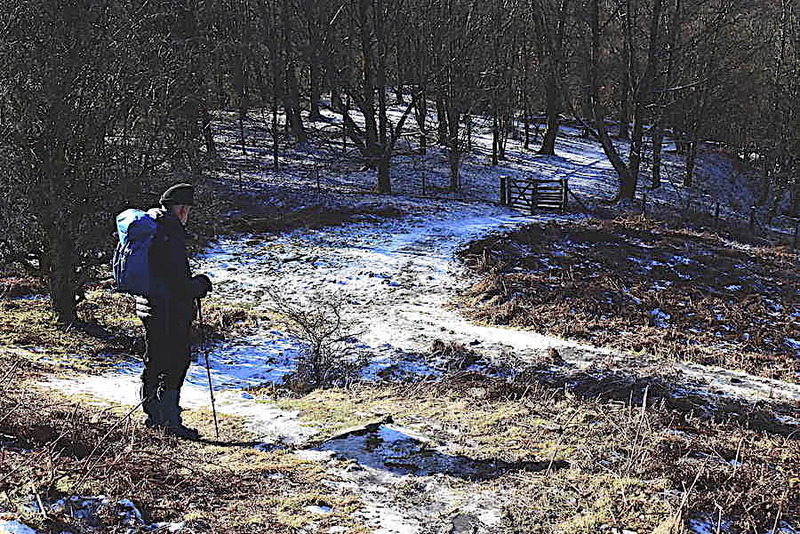 The spikes are already on as conditions underfoot are very icy. 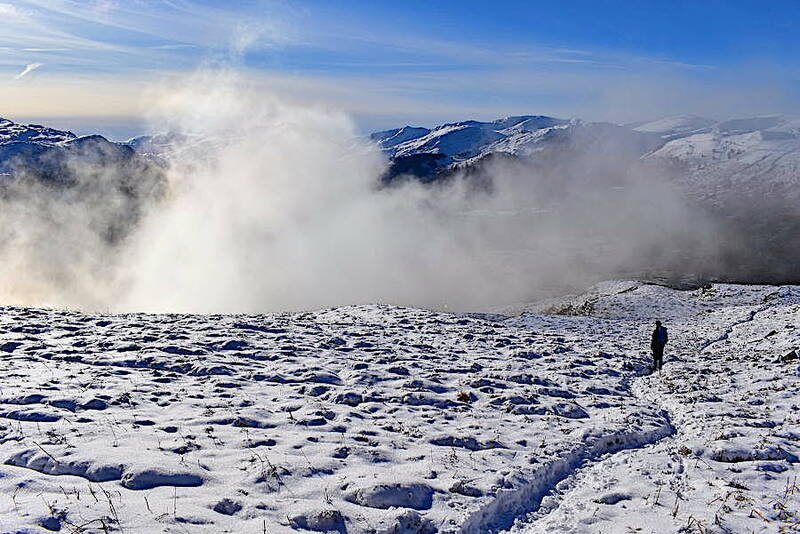 Place Fell above the inversion as we make our way down the path. High Cascades Bridge is just visible in the trees as we make our way down to it. 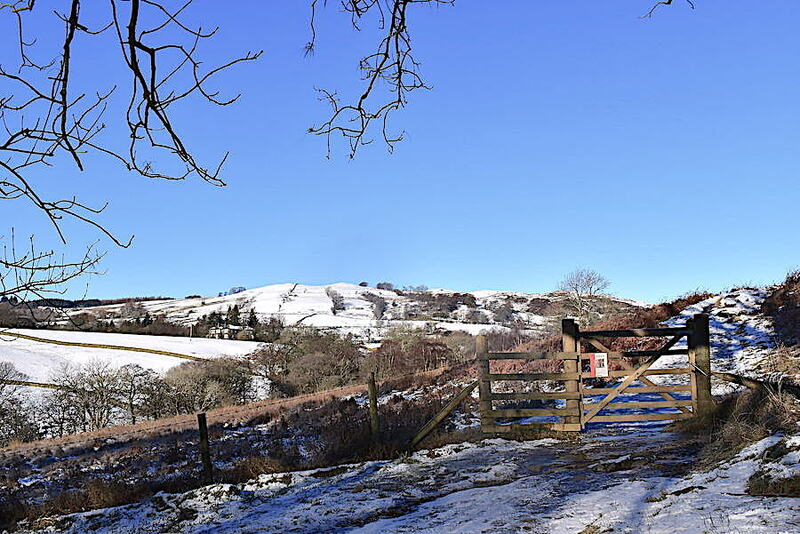 Once across the bridge we’ll bear left up the slope and continue along the very icy path over to …..
….. this gate, beyond which we are out of the chilly wooded area and on to the sunny open fellside. 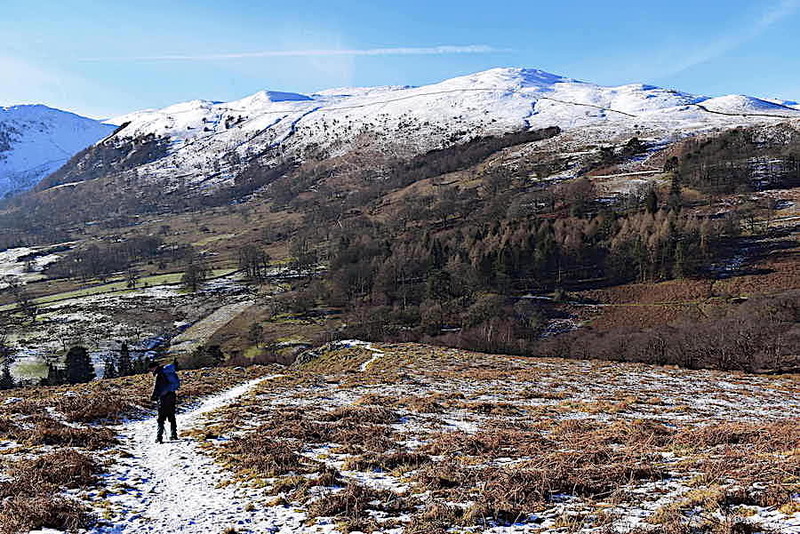 A look back to Birks and Saint Sunday Crag as we leave the woodland behind and cross the open fellside. We leave the main path at this point and head across towards the stand of trees ahead. Judging by the quantity of footprints along here this has been a popular little walk over the last couple of days. The frozen snow produced that lovely, satisfying scrunch under our boots as we walked over it. 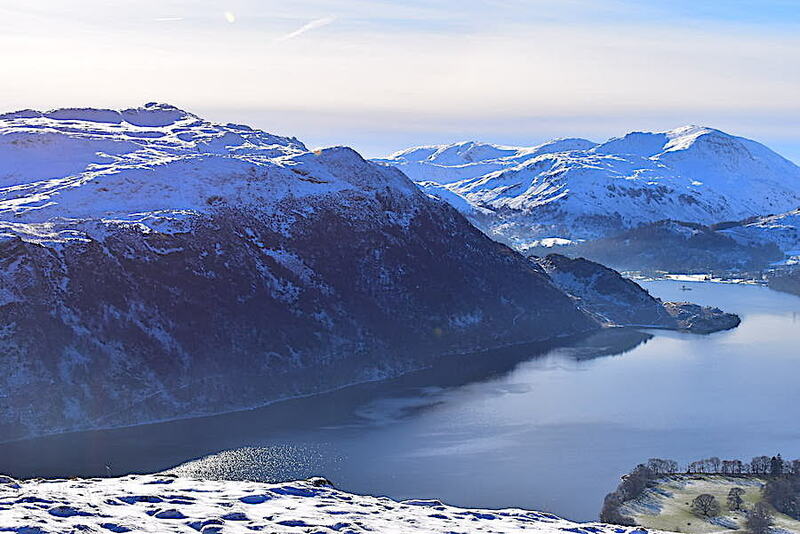 The inversion above Ullswater is still quite dense although we can’t see how far along the water it stretches. A look back as we begin to head uphill. Parkgate Farm is tucked into the trees on the left with Watermillock Common rising behind it. 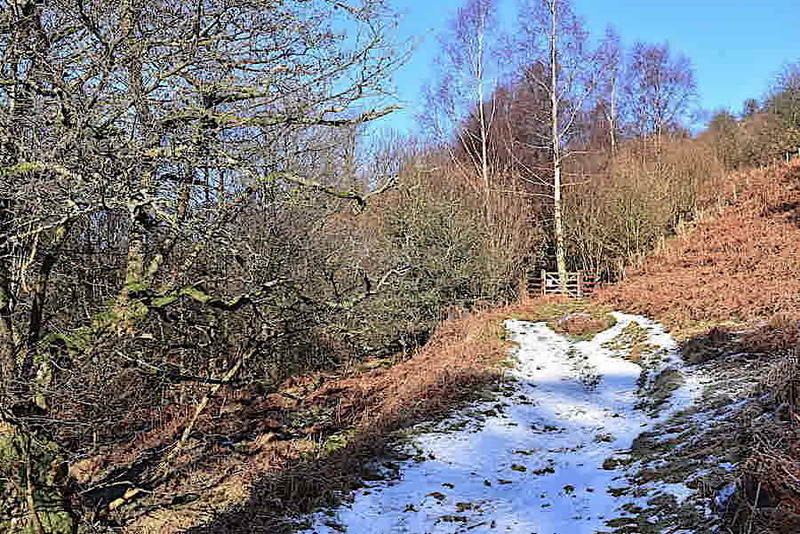 Another play with the zoom for a closer look at Watermillock Common where we took our last walk of 2018 and got battered by the wind as we walked back along the tops. 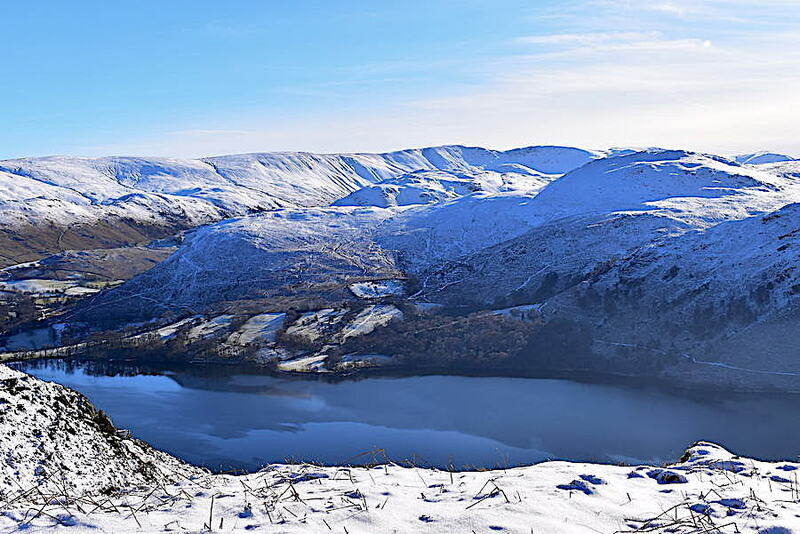 Watermillock Common again with Glenridding Dodd, Sheffield Pike and Birkhouse Moor to the lower left of it. 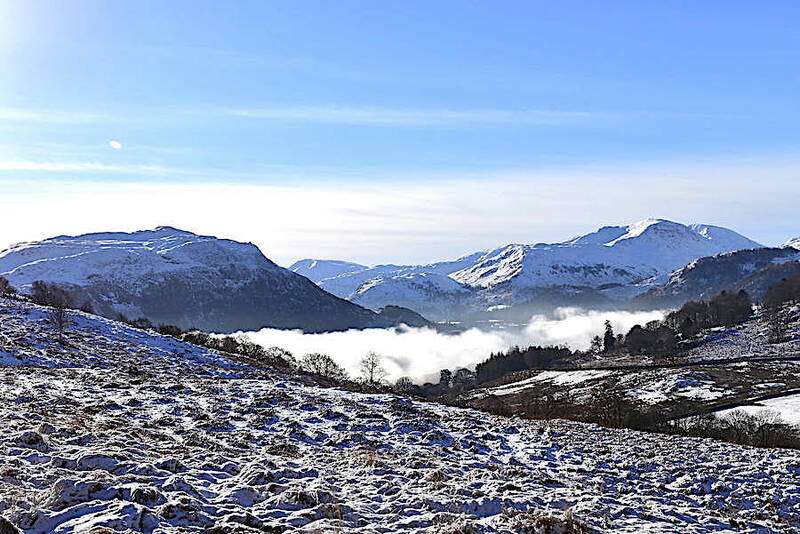 The inversion looked to be breaking up a little as we continued to climb, so I had a closer look …..
….. yes, its definitely dispersing. 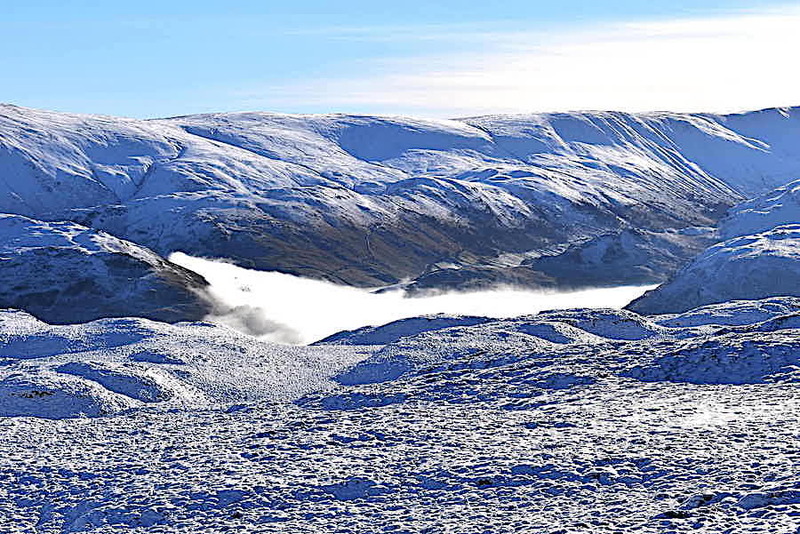 Weather conditions have to be just right for inversions to occur but you can never be sure just how long they will last so experiencing them is often as much luck as it is judgement. 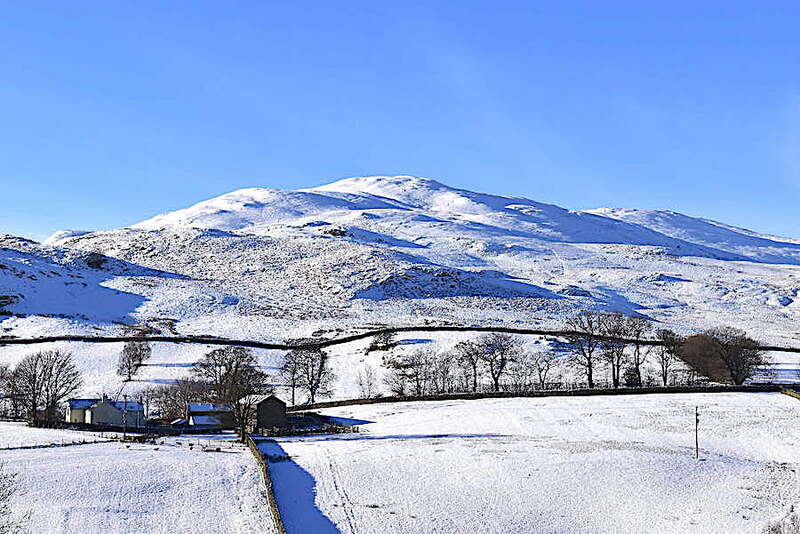 Above the stand of trees now and the tops of the higher fells to the west of us begin to appear. 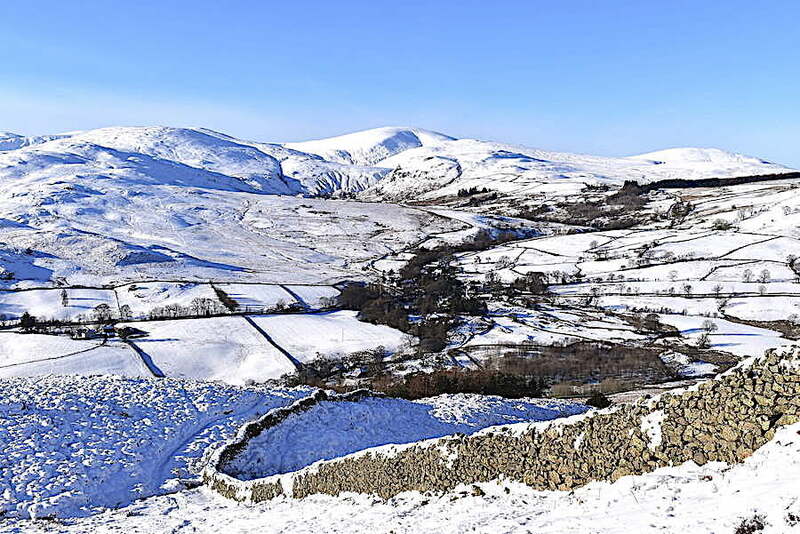 To the right of Watermillock Common we can now see Great Dodd and Clough Head …..
….. while a little further to the right Blencathra is peeping above Matterdale. 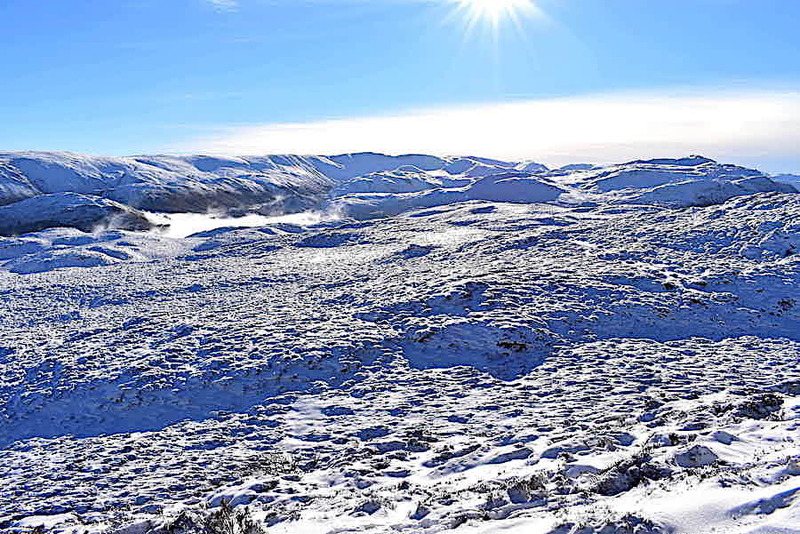 As there’s nothing to see in front of us but a steep slope full of snow the best views are always behind us. We’ve almost reached the ridge path now and during the climb the air was unbelievably warm. 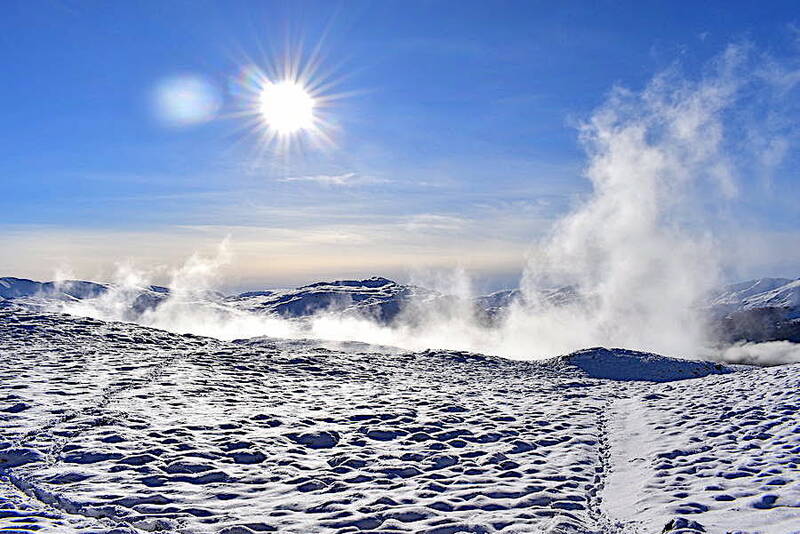 With the constant sunlight and no wind chill factor, thanks to the lack of even a hint of a breeze, jackets were fully open, fleeces unzipped as far as possible and we still had sweat pouring down our faces. I had even taken my gloves off because I just didn’t need to wear them. The view over to our right as we turn up onto the ridge path. 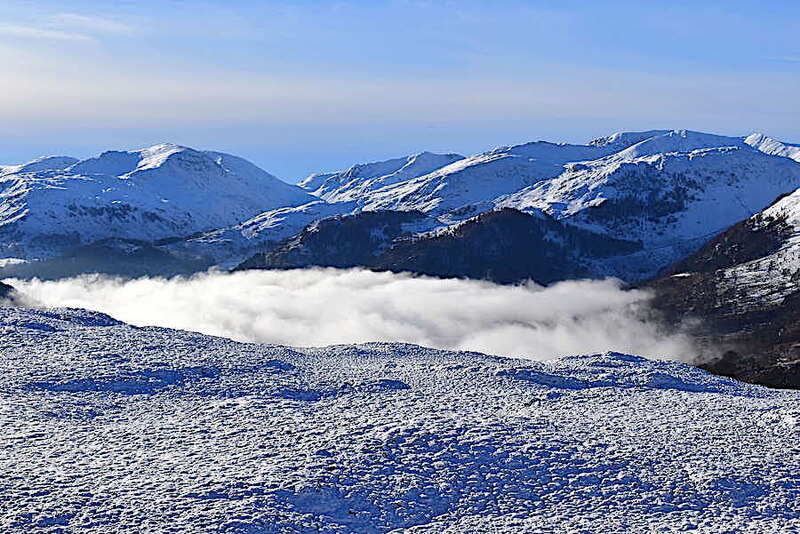 We had thought that the inversion was dispersing but it still looks as thick as before below Place Fell. 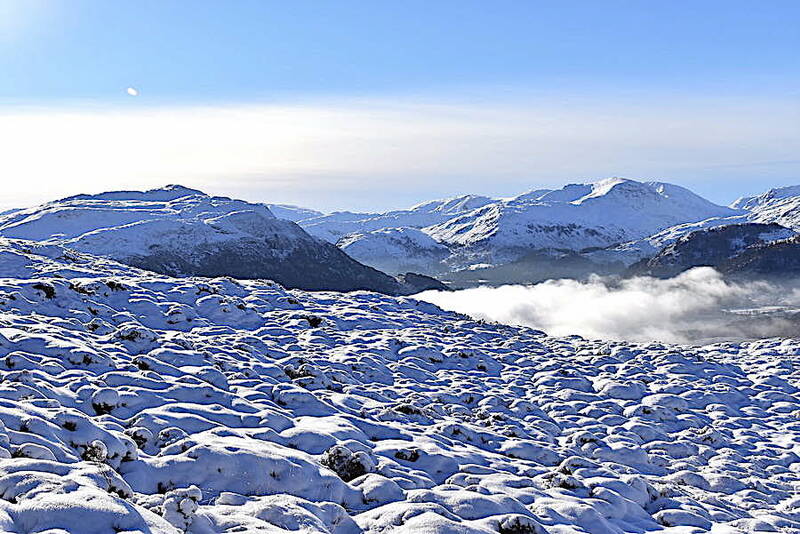 Over on the extreme right of the shot Helvellyn is just beginning to show on the skyline. 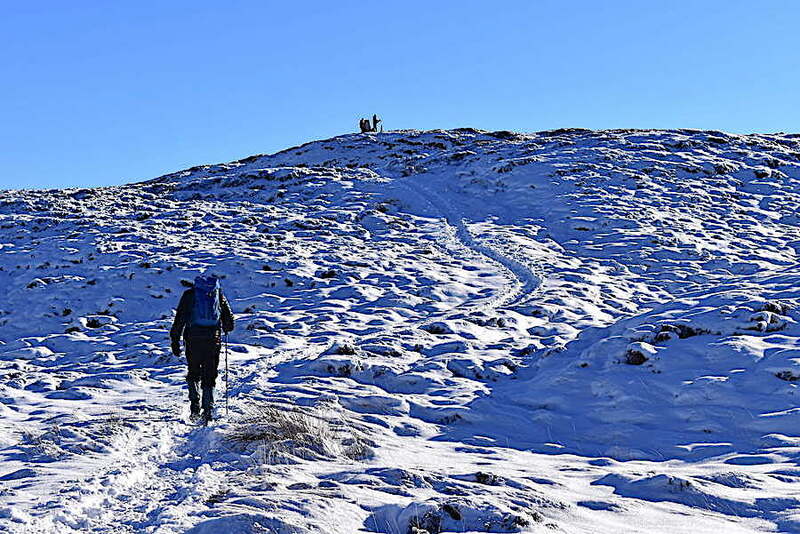 Crossing the ridge path now where the deep snow covering the tussocks of grass gives them the appearance of mini snowboarding moguls. The pair of walkers, who were leaving the car park just as we arrived, are up on the summit just ahead. The chap had his OS map open and was studying it intently, his female companion was taking a break against the trig column, and their dog was sitting beside them both, patiently waiting for something to happen. 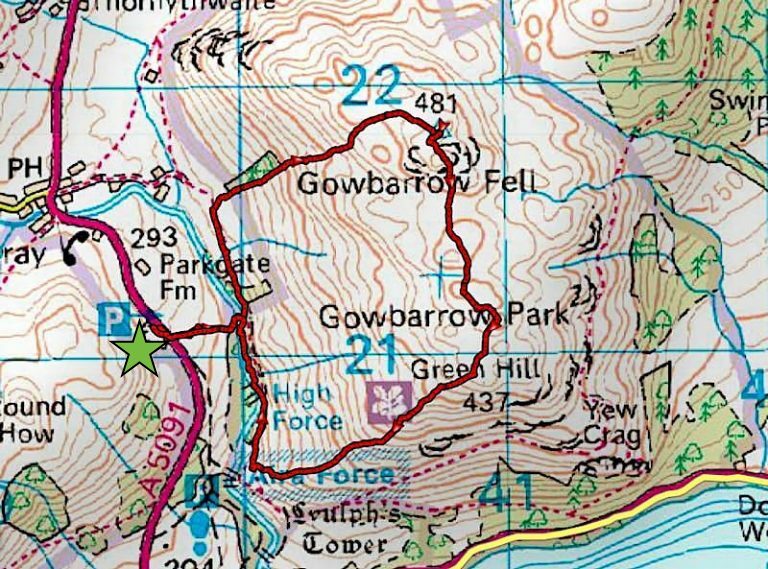 You can’t really get lost on Gowbarrow though because its a stand alone fell and once at the top there’s nowhere else to go but down. The worst that could happen would be to finish up on the other side, or at the other end of it, from where you started when you were back down. Inconvenient, but not irretrievable. 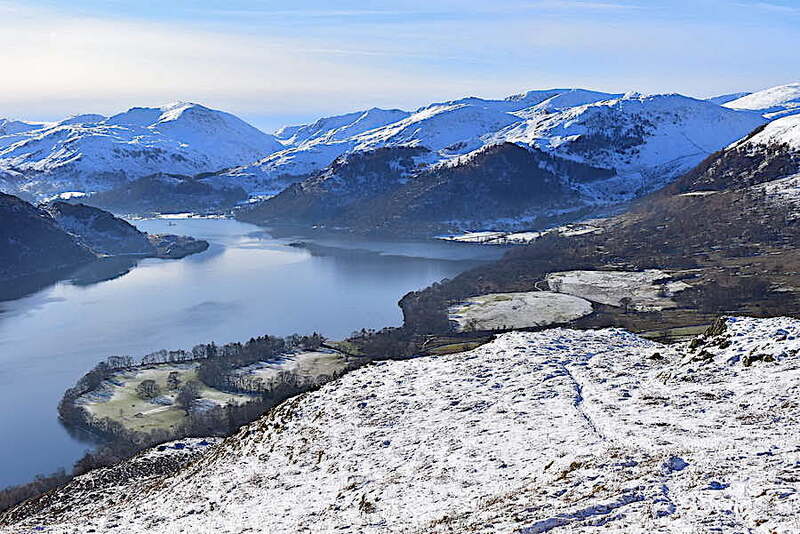 As we reached the top the two of them were just beginning to make their way down, towards the terrace path above Ullswater judging from their direction of travel, while I take a look down at what will be our next direction of travel. From here we’ll drop down and follow the path leading off to the left of the shot and make our way across to Green Hill. 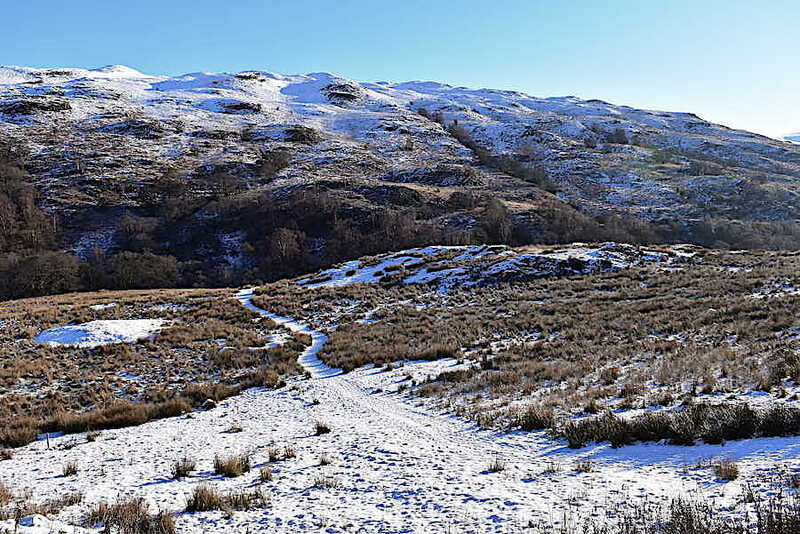 We could also follow the path straight ahead which would eventually lead us back to the path above Aira Beck but this is already quite a short walk and taking that route would make it even shorter. 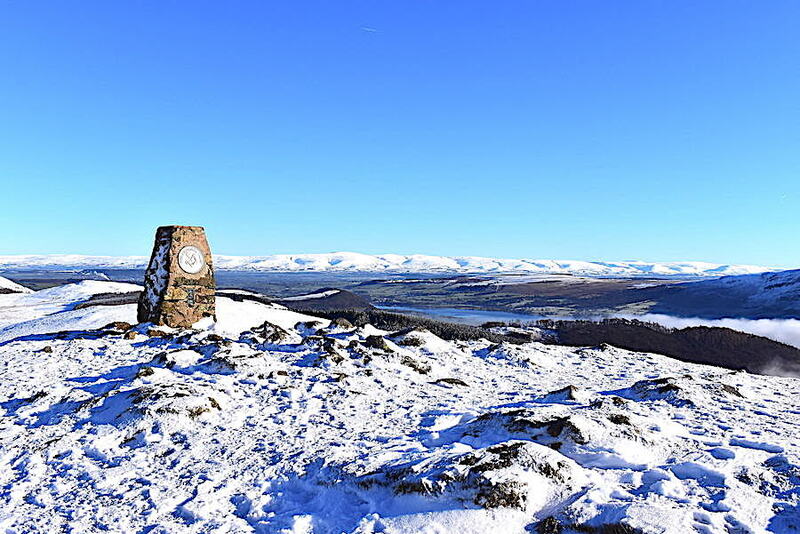 In any case its too nice a morning to hurry so we decide we’ll sit awhile up here, take a coffee/Mars Bar break and just enjoy the views and the unusually calm and warm weather up here. 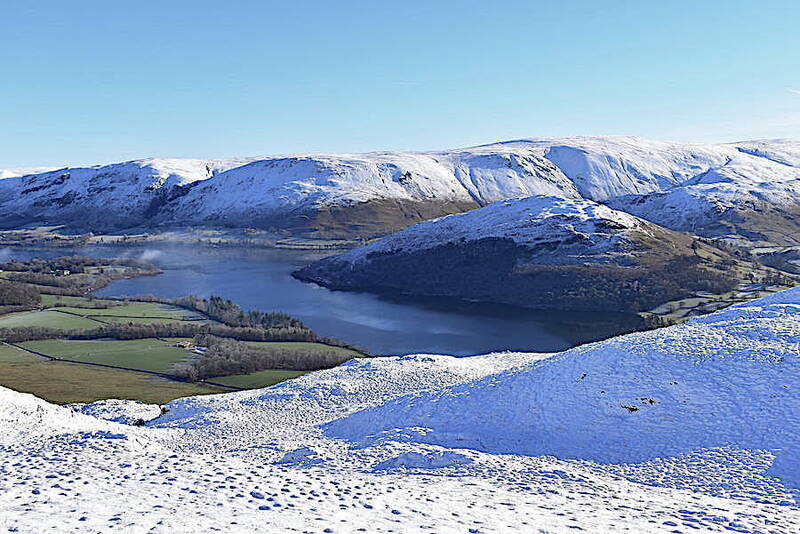 A few views from our coffee stop perch on Gowbarrow summit. 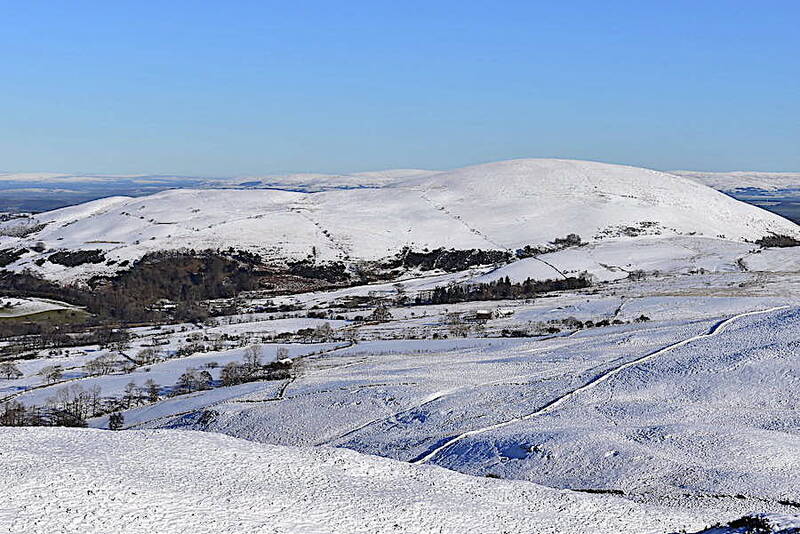 Looking to our left to begin with, and on the skyline are the north Pennines across the Eden Valley. 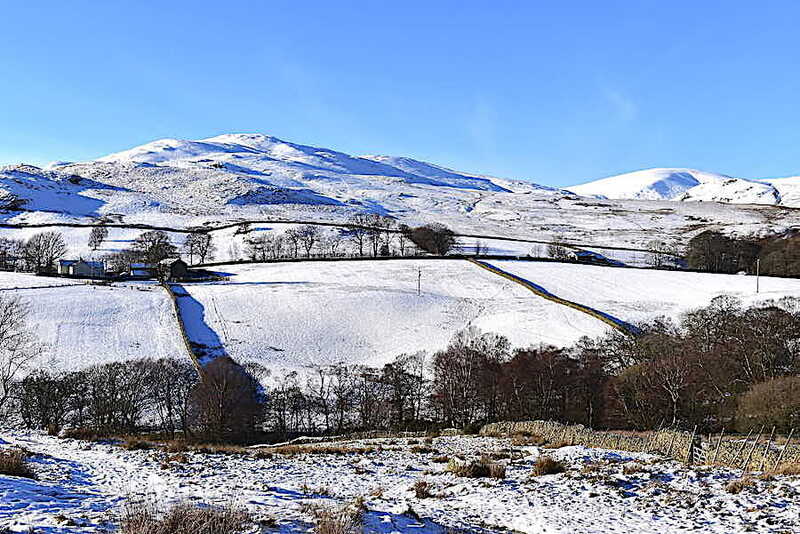 More or less in the centre of them is Cross Fell, the highest point on the Pennine range, and somewhere behind the low hill, with the green fields, on the right is where we live. 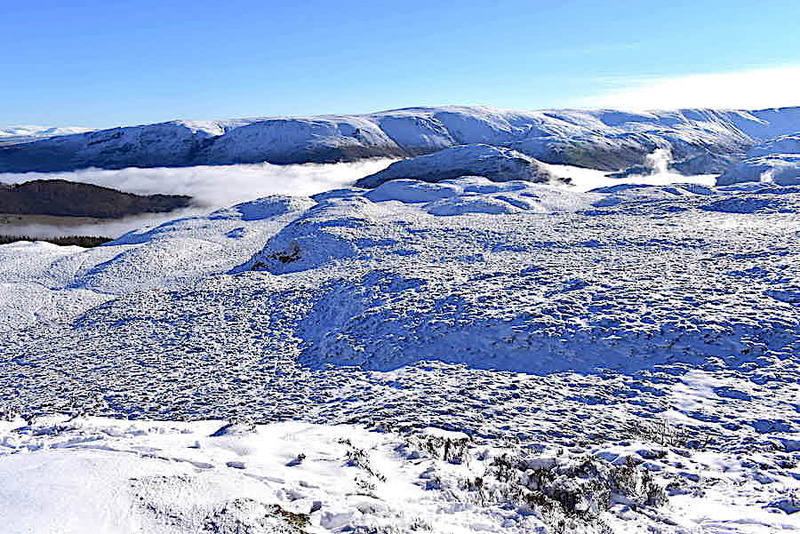 A little further to my right and rising above the Ullswater inversion are Arthur’s Pike, Bonscale Pike and Loadpot Hill …..
….. while a little further to the right is the ridge leading on from Wether Hill up to High Raise (the Mardale one), below that is the Steel Knotts/Gowk Hill spur and then the valley of Martindale. 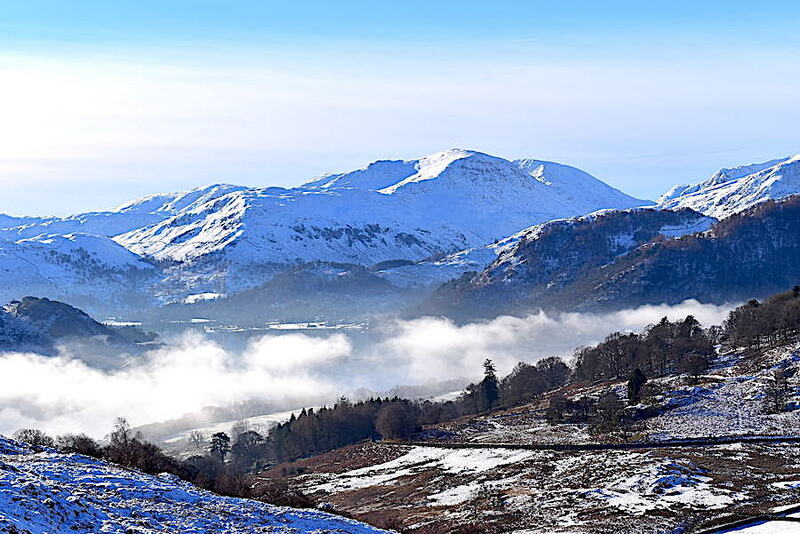 The inversion below is swirling between Beda Fell, to the centre right, and Hallin Fell on the centre left of the shot. 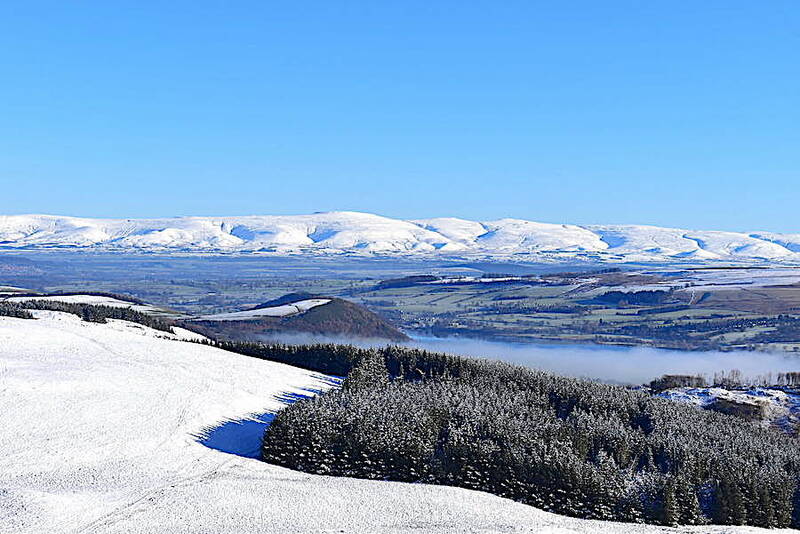 Coffee break over so a few shots from the summit area, here looking towards Great Mell Fell …..
….. and now looking towards Little Mell Fell …..
….. to the west is Blencathra which looks to have quite a decent covering of snow now, after not having had much more than a dusting lately, and Skiddaw, over on the left, which looks to be smothered in it …..
….. another look eastwards where only the upper slopes of Hallin Fell appear above the inversion, which is still very thick and hanging around for much longer than we thought it would …..
….. looking southeastwards now, across the undulating top of Gowbarrow, towards the summit of Place Fell, over to the right, and in the centre of the skyline the curved outlines of High Raise and Rampsgill Head …..
….. looking across Swinburn’s Park towards the north Pennines again, where the inversion has cleared over the northern end of Ullswater but remains as thick as ever around its middle reaches. 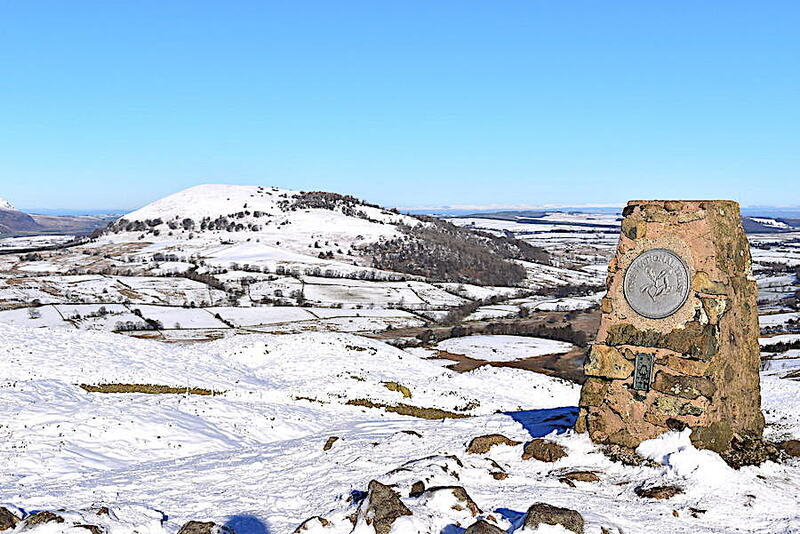 It was absolutely lovely to be up here …..
….. on such a fabulous day, not a breath of wind, warm sunshine and taking photos with warm ungloved hands. 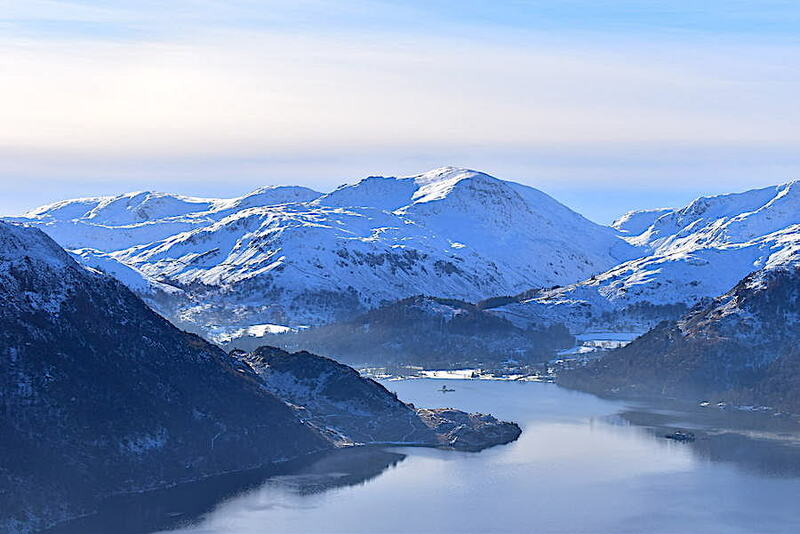 We weren’t in a hurry so we stayed a while longer and quite simply just enjoyed the moment …..
….. which gave me more time to get to know (play with) the new camera, well you can’t let these gorgeous views go to waste, can you? 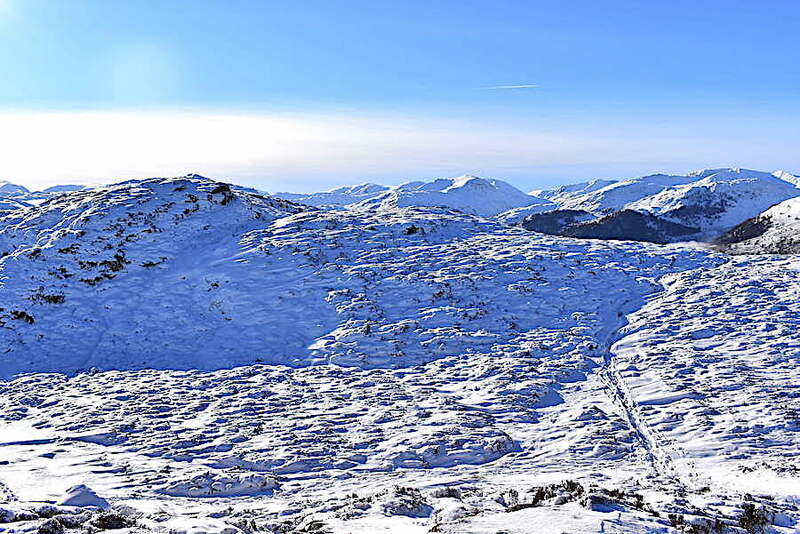 Over on the left skyline are Dollywaggon and Nethermost Pikes, followed by the Striding Edge route up to Helvellyn. 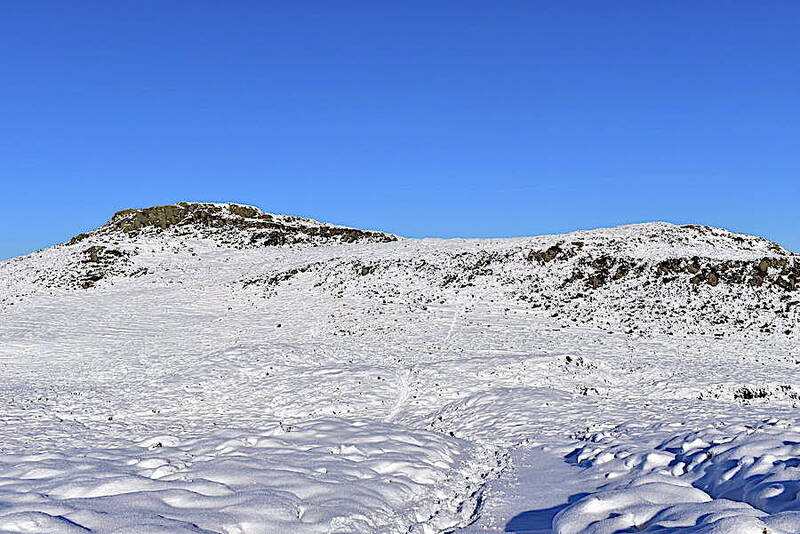 Below the gap between them is Birkhouse Moor after which come the rising slopes of Catstycam. 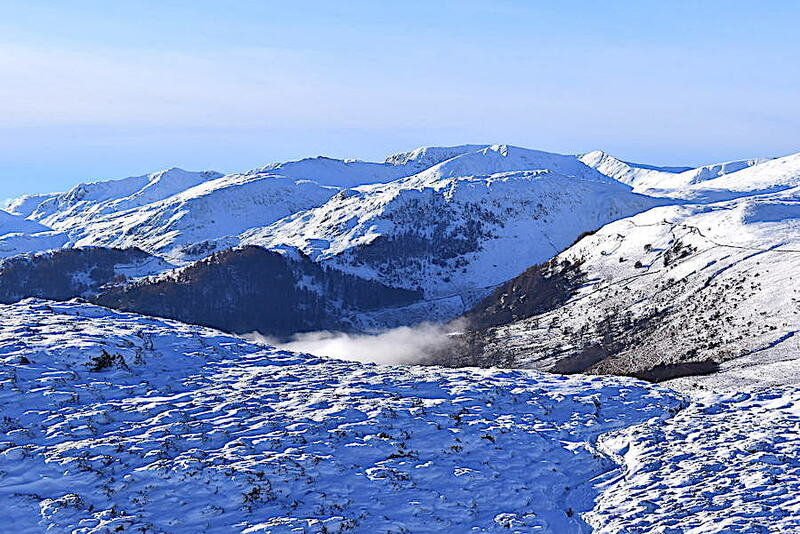 To the right of that is the snowy ridge between Helvellyn Lower Man and White Side and below Catstycam is Sheffield Pike and the wooded slopes of Glenridding Dodd. Watermillock Common is on the right of the shot. 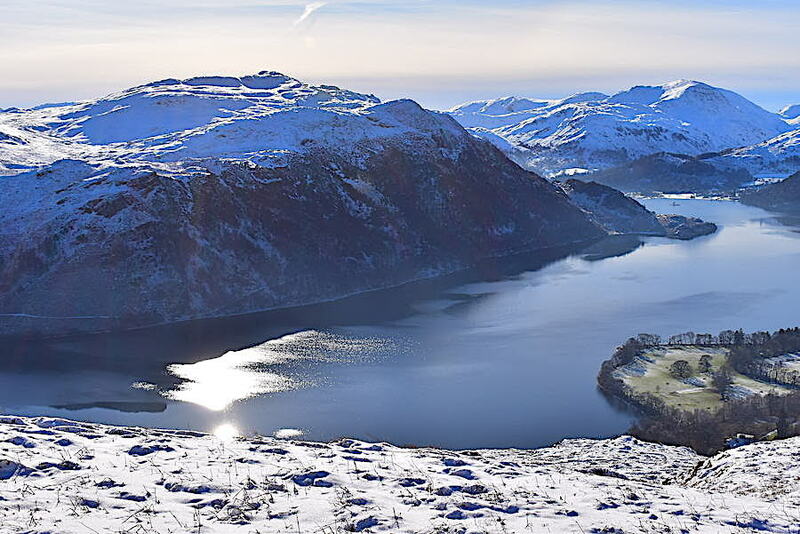 Every now and again we would see clouds of mist rising up from Ullswater which were quite magical to watch as they swirled around and gradually evaporated. 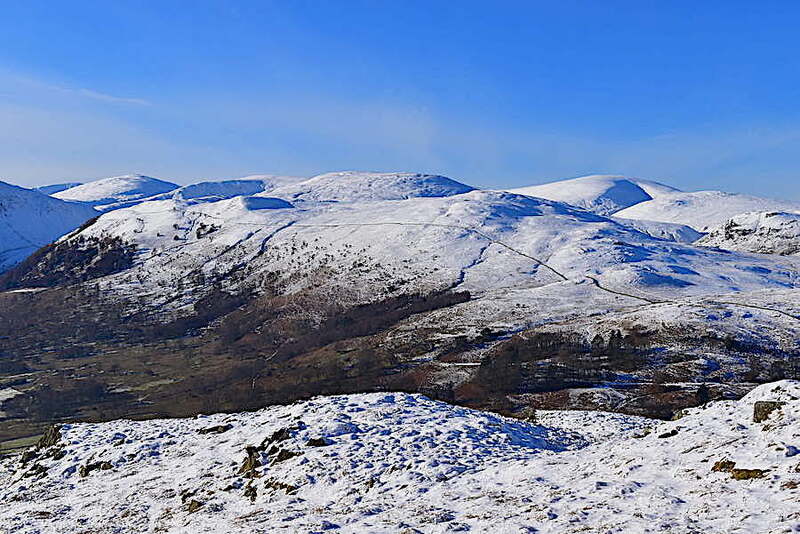 Skiddaw, Blencathra and the northern fells across Gowbarrow and Threlkeld Common. 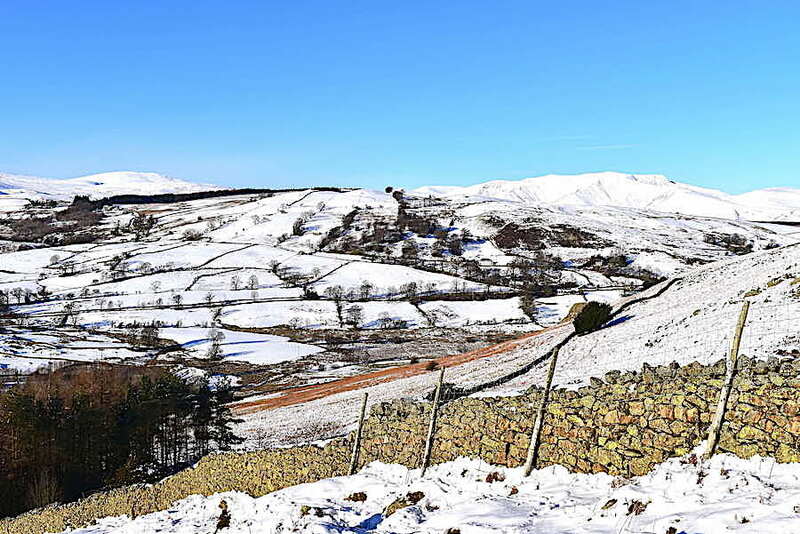 Oh go on then, before we leave, just one more shot of Great Mell Fell followed by …..
….. just one more shot of Little Mell Fell. I don’t know how long we’ve been up here, probably half an hour or so, but it was so wonderful we were quite content just to hang around and do nothing very much but absorb it all. 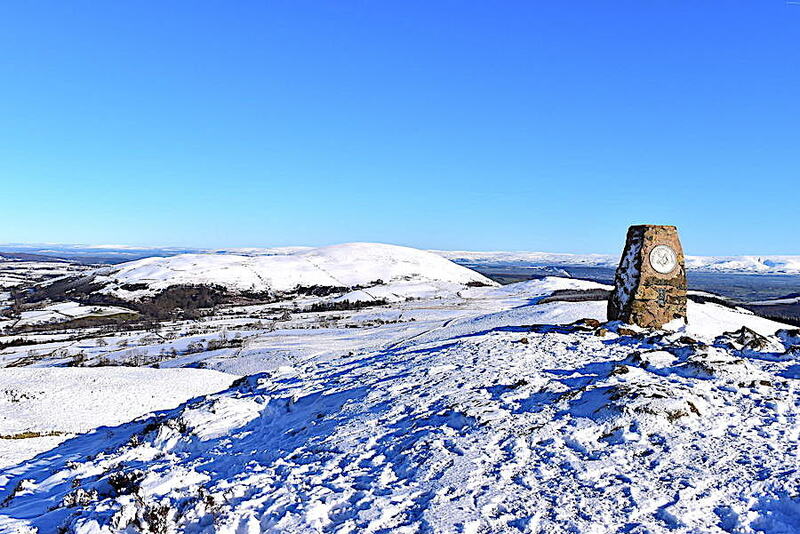 We did finally tear ourselves away and dropped down off the summit to head southwards towards Green Hill with J following in my footprints as we cross the flatter, and usually squelchy but not today, area between the two points. 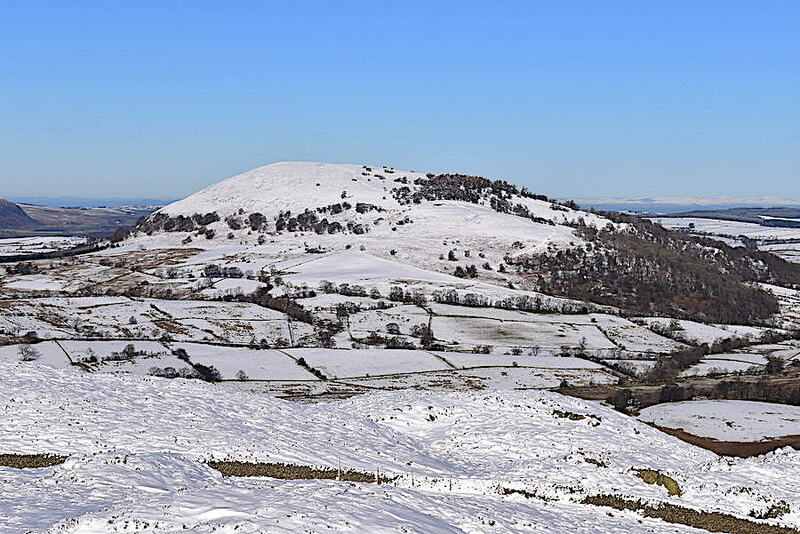 You can see from the depth of the prints that there is a good layer of snow on Gowbarrow. 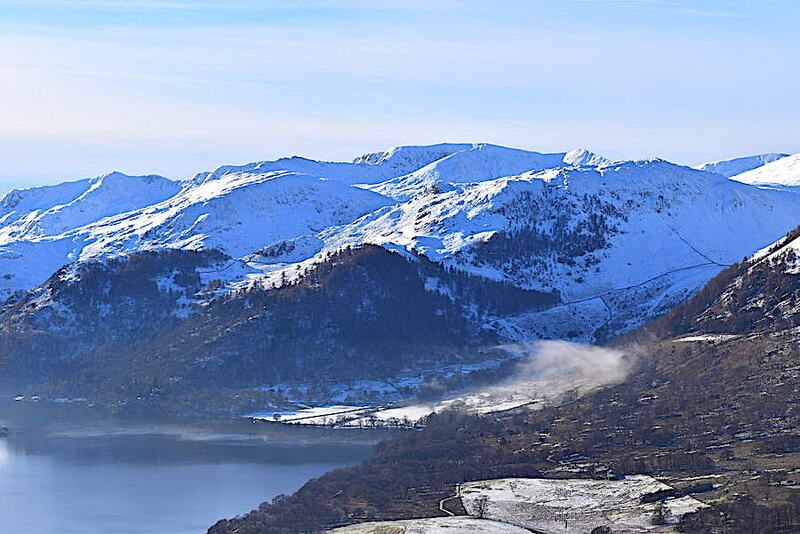 The inversion still covering Ullswater as I take a look across to Helvellyn, over on the right skyline, and wonder how many walkers would be up there today. Plenty I suppose, but over here there ‘ain’t nobody here but us chickens’ which is just fine by us. A look back to show the undulating nature of the terrain we are crossing. 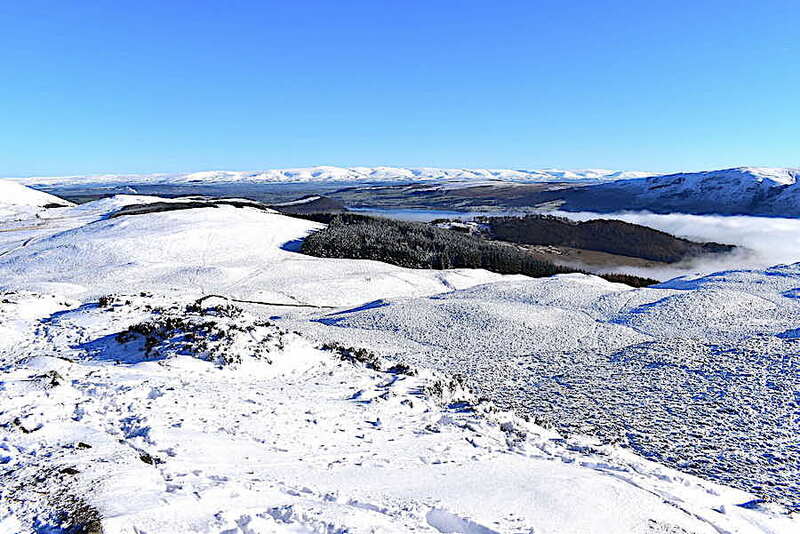 The snow was even deeper across these flatter areas. 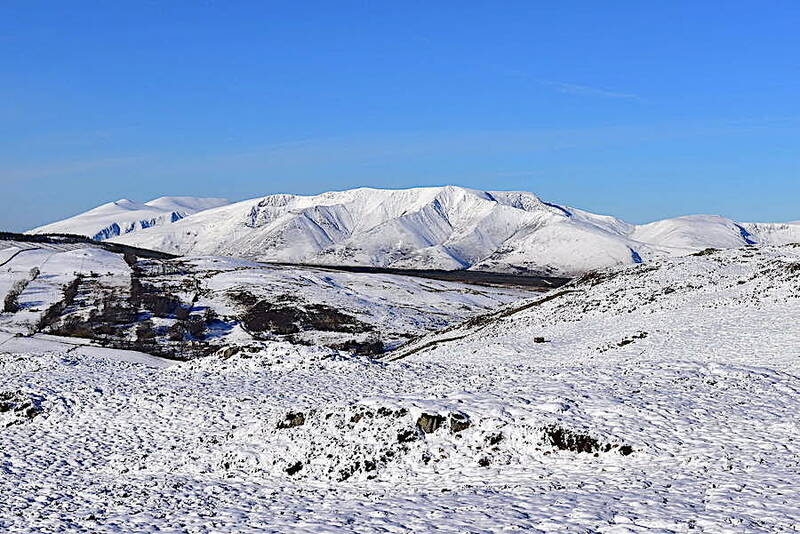 Just couldn’t resist another shot of Skiddaw and Blencathra looking absolutely splendid in their winter finery. Another few minutes of atmospherics as we reach the turn off point for Green Hill …..
….. this one stretched along for quite some distance. Now we turn off and follow the path all the way over to Green Hill, ignoring the path going off to the right just a little way along. 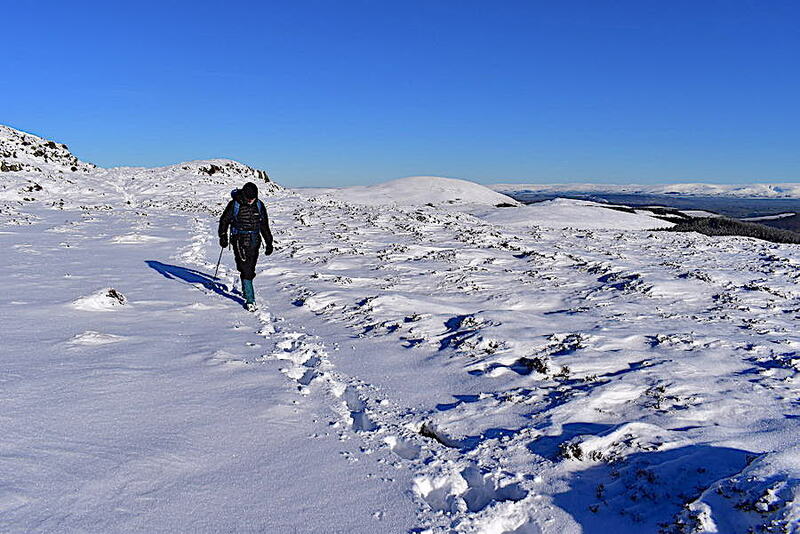 Happily a solo walker had already blazed a trail which was very helpful through the deep snow, unhappily for us he hadn’t continued all the way to Green Hill so we were back to ploughing our way through untrodden deep snow again. On quite a number of occasions I put my foot down and continued to sink in well above my knees. Just as well we weren’t in a hurry since its impossible to rush through deep snow. 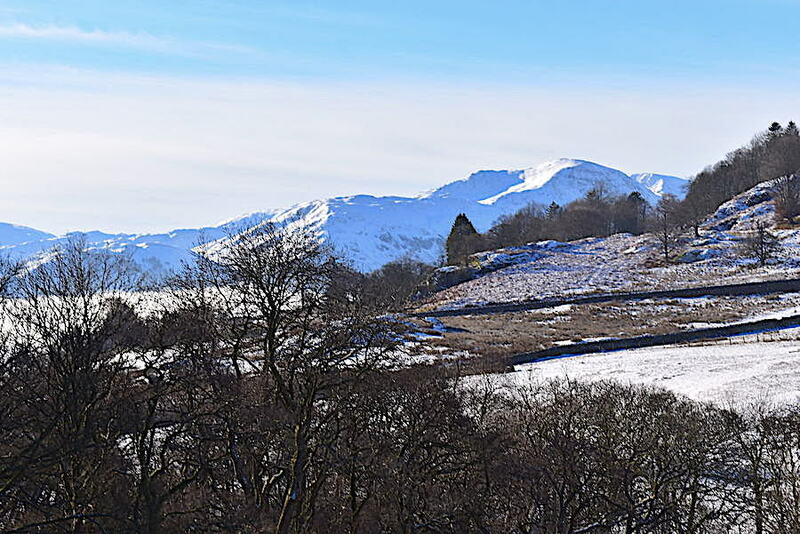 Trying out the zoom lens again for this close up of Hallin Fell with Loadpot Hill behind it. 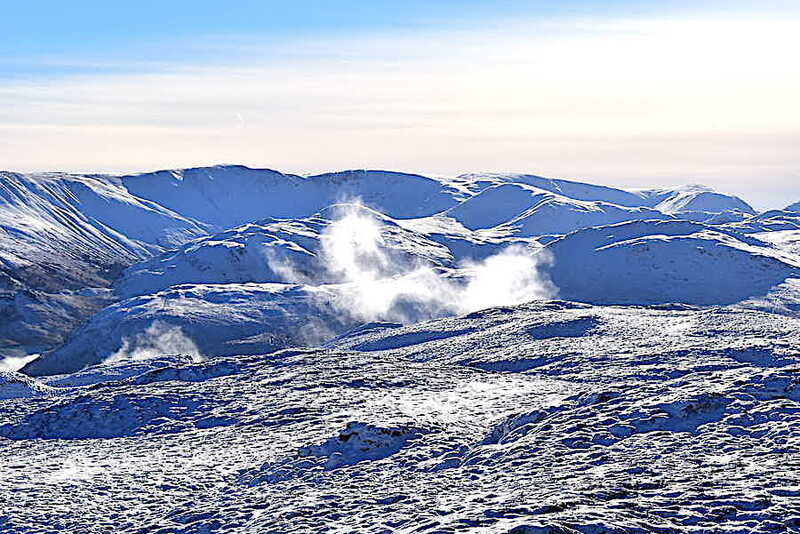 While we’ve been busy crossing over to Green Hill the inversion has been busy evaporating so there’s nothing left see now …..
….. apart from these wispy remnants hovering over the green fields on the left. I’m amazed that it lasted this long since its getting on towards lunch time now. 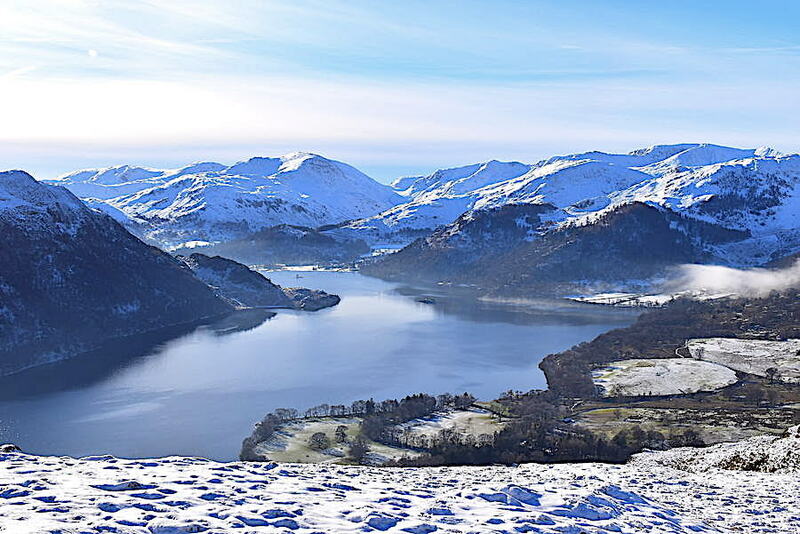 The lovely view along Ullswater from Green Hill, with another inversion remnant just about to disappear below Glenridding Dodd on the right. 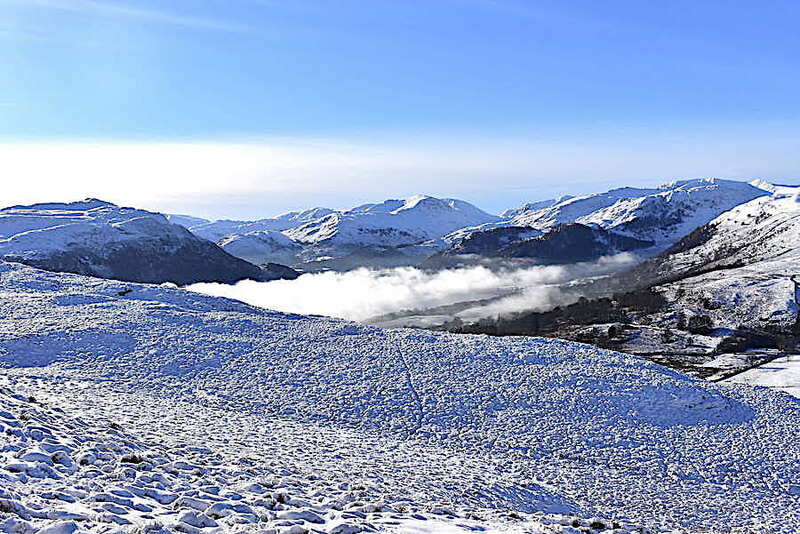 Thankfully that band of cloud hasn’t moved any nearer to us all morning so we still have the sun to highlight the views of Saint Sunday Crag and Gavel Pike, in the centre, with Hart Crag and Dove Crag to the left of them. 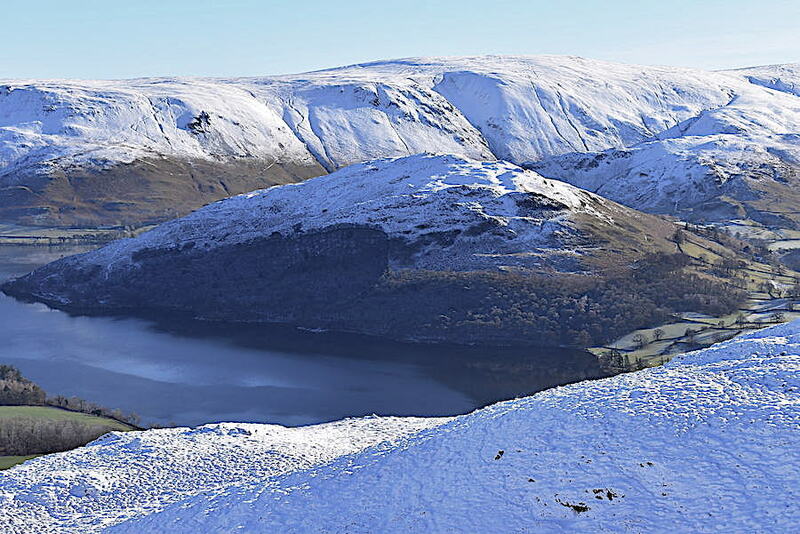 Place Fell with Silver Point jutting out into Ullswater. 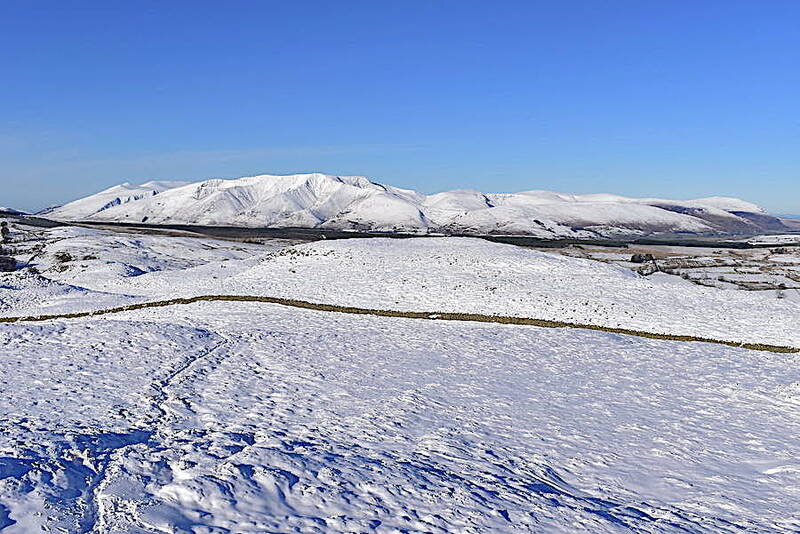 Blencathra and the view northwards from the cairn on Green Hill. 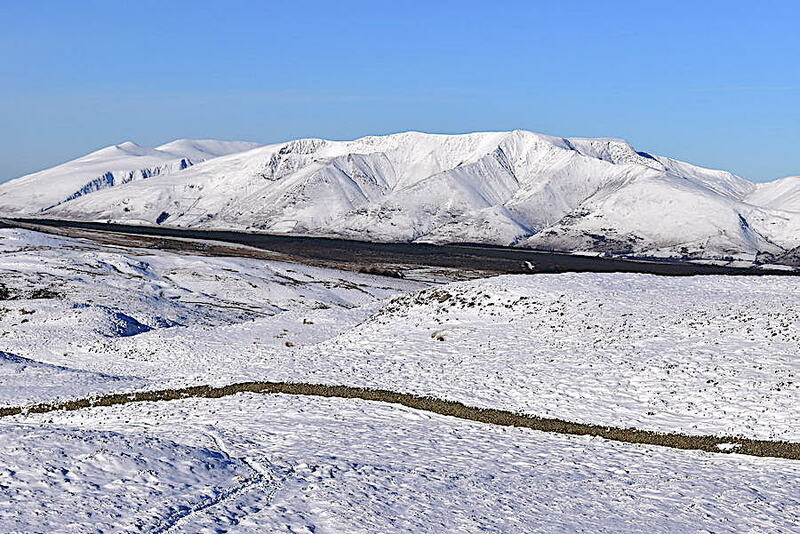 Watermillock Common and the fells to the west of us from the cairn. 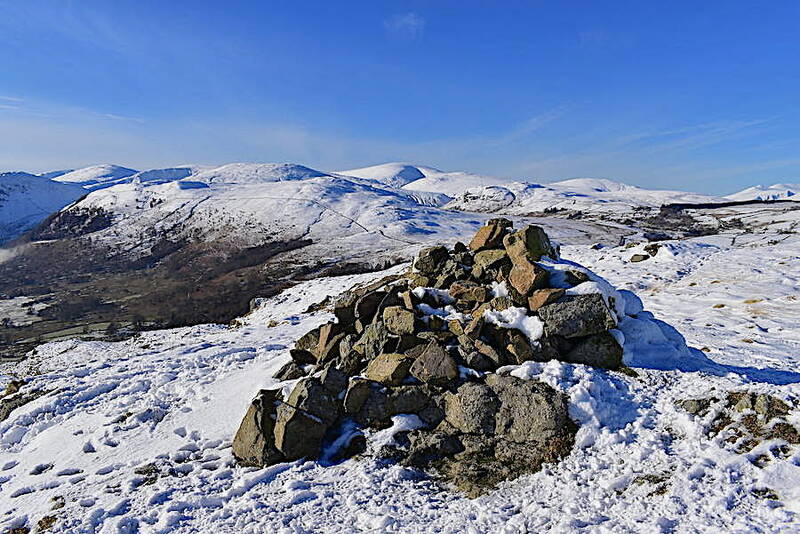 Looking to the east from the cairn with Arthur’s Pike, Bonscale Pike and Loadpot Hill on the skyline. 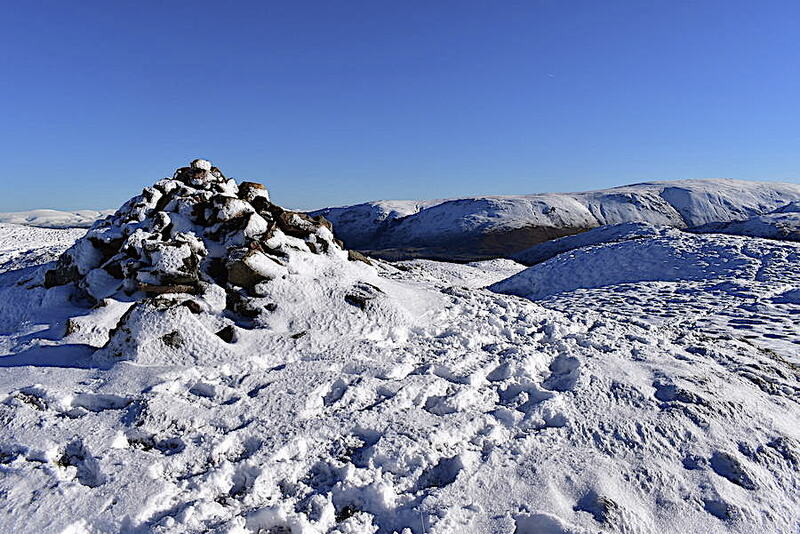 To the south west of us, and the highest point on the skyline, is Helvellyn. 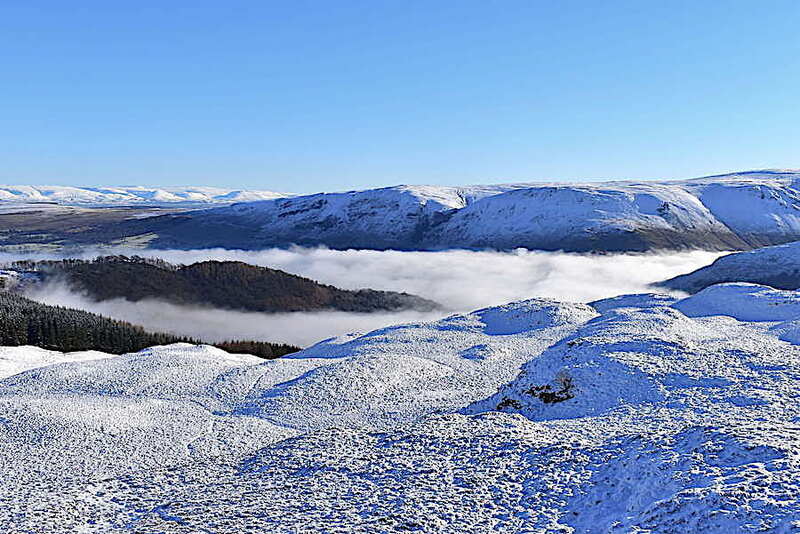 Out of the blue up came this lot and proceeded to drape itself across the fellside ahead of us. Wondering how much of it was below us and how long it might last I went over to the left to take a look …..
….. only to find the whole thing over and done with by the time I got there, a matter of less than thirty seconds, with J out of shot to the right telling me that it had just vanished as quickly as it arrived. 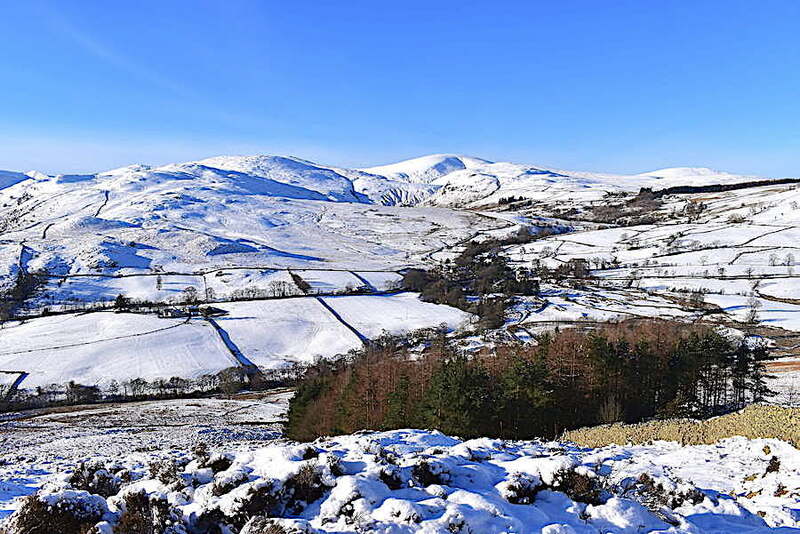 Continuing down from Green Hill on a well trodden path …..
….. with views of Watermillock Common and its neighbours …..
….. and Ullswater and the fells to the east to keep us interested all the way down. 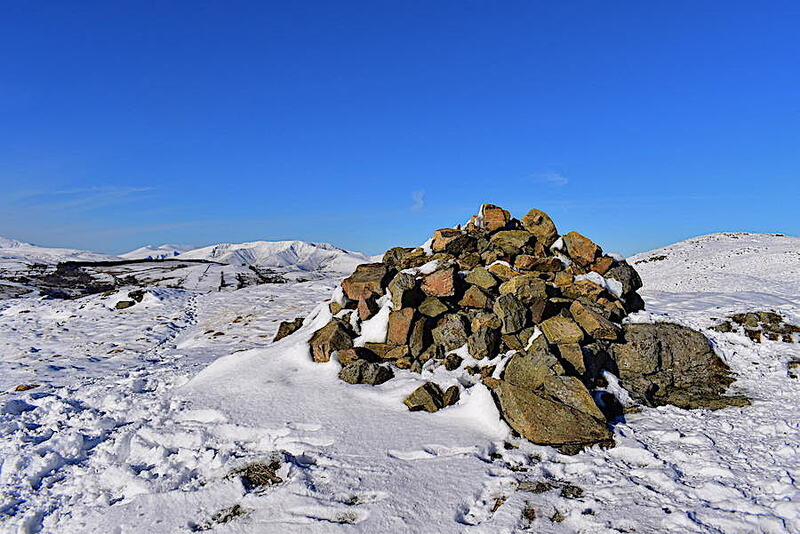 The zoom lens was brought into play once again for this view of the summit of Place Fell although I couldn’t see anyone up there at the time. 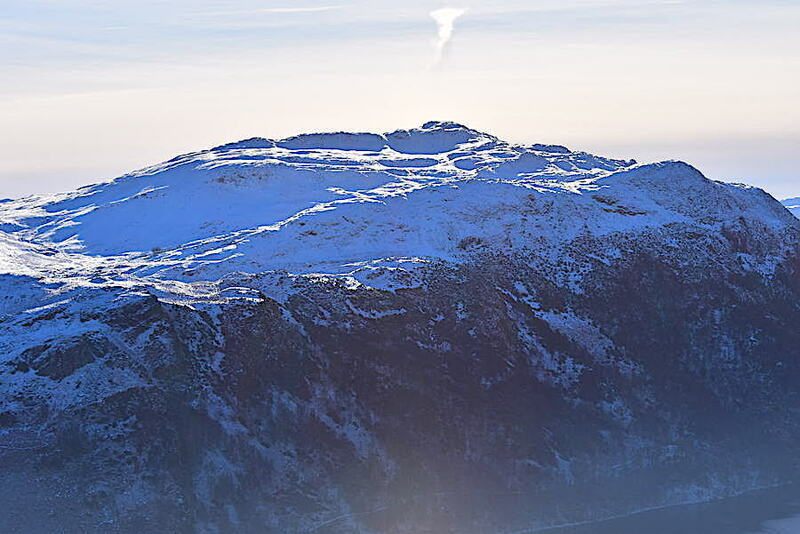 I couldn’t decide what the white phenomenon above the summit might be, its also in the photo I took four shots back. I couldn’t quite decide if it was smoke from some industrial activity or a spiral or whirlwind type of cloud formation. Still descending and just beyond the hill below us we met two walkers coming up towards us, perhaps in their late twenties, whose reddening faces were bathed in sweat, the young man much more so than the young woman who was with him. Both were breathing hard and by now were down to their short sleeved t-shirts with their jackets and jumpers tied around their waists. We only had a brief chat with them, from the Liverpool area I would guess from the accents, before we went our separate ways. I think they were too short of breath for anything more. I looked back up before carrying on down and was glad I wasn’t having to climb it because its still very warm up here. 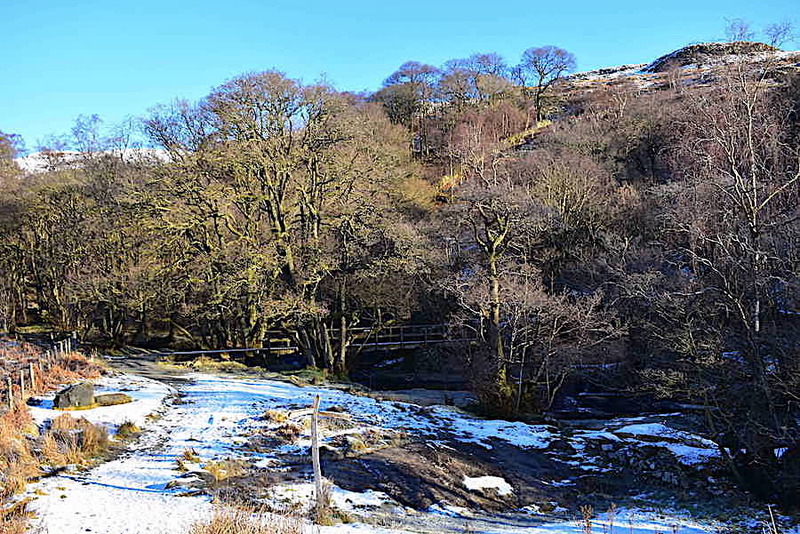 We’re almost down to the tree lined ravine through which Aira Beck travels down to Ullswater. 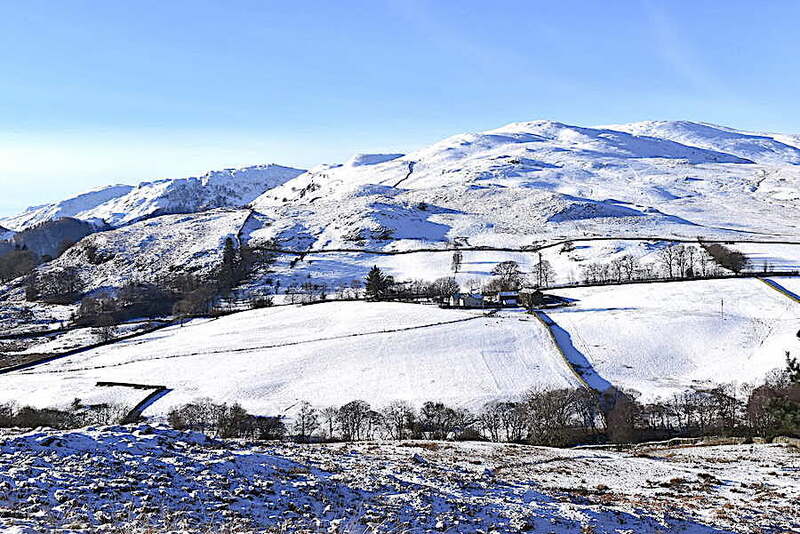 We’ve left the thick snow behind and the higher fells have disappeared from view behind Watermillock Common again. Down into the woods once again and at the junction we take the path going off to the right of the shot for the walk back up above the beck. 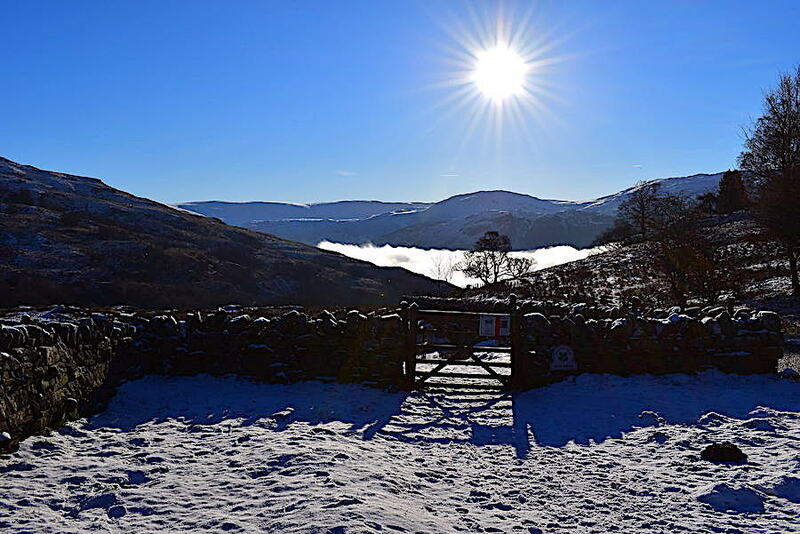 Going straight on through the gate leads back to Aira Force with its car park and tea rooms. 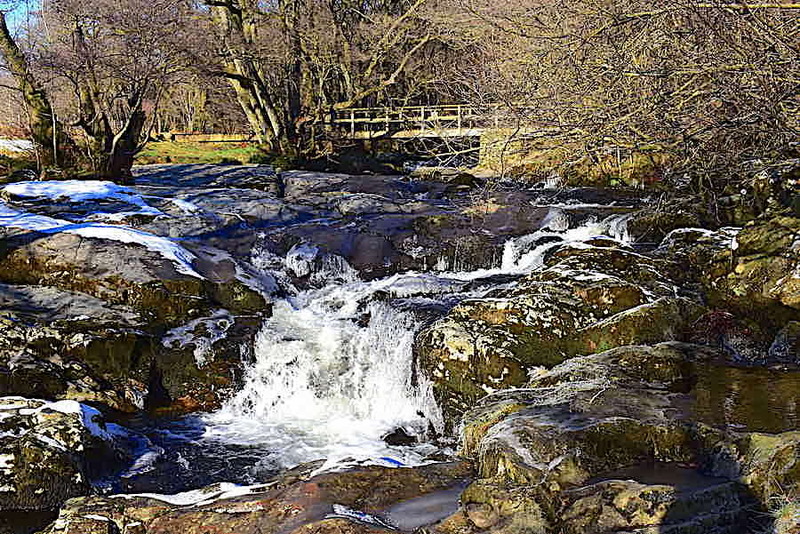 We carry on to the gate ahead, pass through it and walk through the woods back to …..
….. the High Cascades Bridge across Aira Beck …..
….. where today’s walk comes to an end. 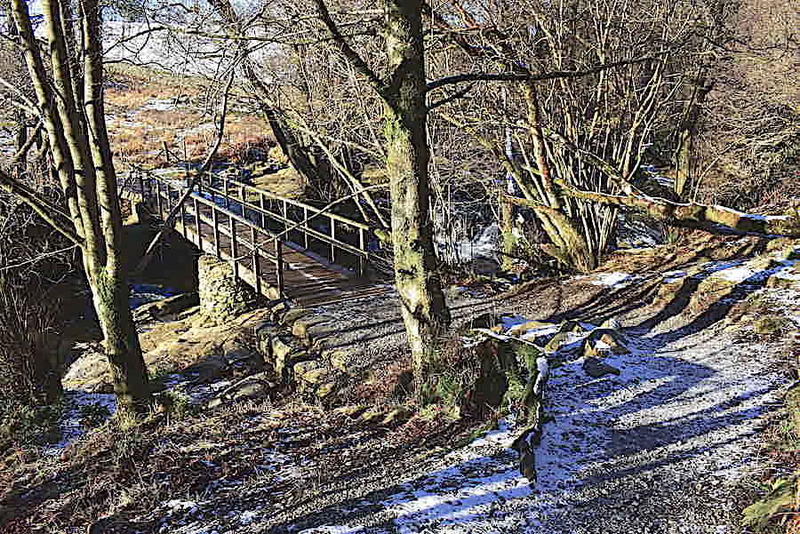 We just have to cross the bridge, go through the gate on the opposite bank and then climb the short rise back up to the car park. We didn’t bring any food with us because its only a short walk so we’ll have a late lunch when we get back home. It might only have been a short walk but it was a thoroughly enjoyable morning ramble nevertheless. Gowbarrow isn’t a very big fell but it does have plenty to offer, some steep ascents if that’s what you’re after, plenty of gentler routes if you’re not, great views from the summit in every direction, a lengthy beck with lots of falls and cascades with good paths on either side of it, and today at least, as much snow as anyone could wish for and a beautifully sunny and wind free day in which to enjoy it all. 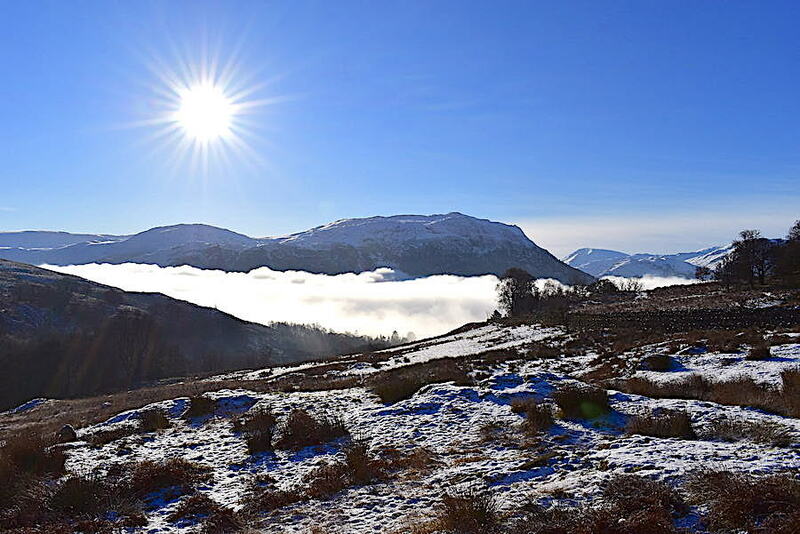 Sometimes you might even be lucky enough to catch an inversion over Ullswater. 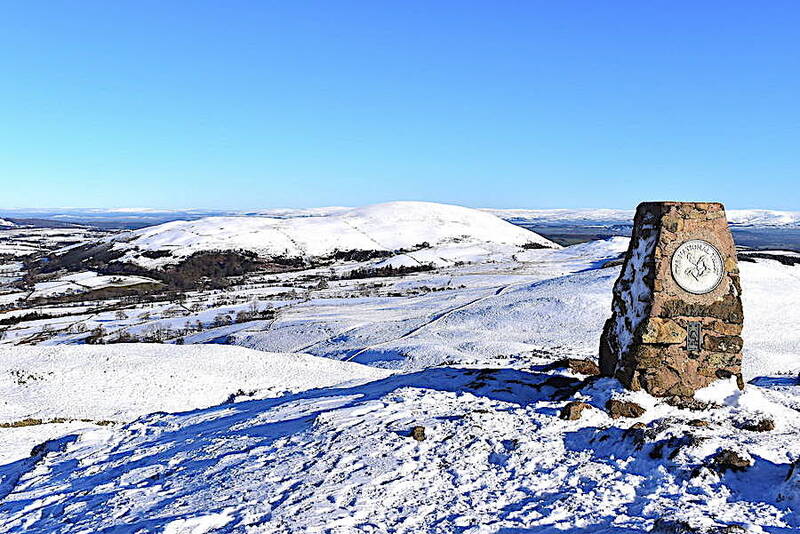 Good old Gowbarrow.